I have been thinking about chocolate pudding for a while and the Tuesdays with Dorie group recently made the chocolate pudding from her Baking: From My Home to Yours book and I was intrigued by the recipe, even though it seemed complicated and the reviews were mixed. I liked the idea that the pudding should be silky smooth after being whirred in the food processor. I was a little disappointed in the recipe. When it was warm, it was this was a little too “foamy” and disappointing. When it cool, it was better, but not my favorite. 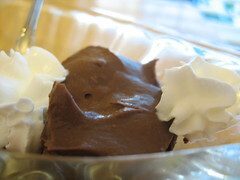 Recipes can be found at TWD Chocolate Pudding Host, It’s Melissa’s Kitchen or on Dorie’s blog. I garnished with a little whipped cream for the picture. In a few weeks when I get the feeling to make pudding again, I’ll use the pudding recipe that I prefer, from Hersheys.